2mm North East Area Group: A Scale Trackplan (At Long Last)! A Scale Trackplan (At Long Last)! 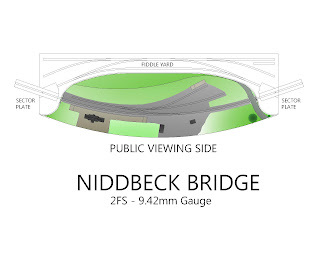 Thanks to Andy Hanson I now have a decent trackplan of 'Niddbeck Bridge'. I've not had a scale plan up to now!.The layout size was determined by the space available in the back of my estate car and the sheet size of the 'foam-core' board (60" x 40") that I could obtain, and the rest of it was only ever roughly sketched out before construction started. The geometry of the kick-back sector plates was worked out 'on the hoof' etc. Not ideal I know, but it seems to have worked out all right in the end! My recent outing to Shipley Show brought some invites to exhibitions in the years head including York 2009, Wigan 2009, Rochdale 2010 and Birtley 2010, so I needed to draw up a layout data sheet and a decent track plan for these and other show organisers. Andy came to the rescue with this CAD trackplan which is far better than my amateur attempt in MS Paint ! I learnt quite a few lessons at Shipley. The layout peformed well enough but less can be said about my rolling stock. I spent the week before Shipley working on the scenics when I should have been servicing my locos and stock. Main problems were back-to-backs that had shifted after several years in store, wagon wheel rims that had come loose and DG couplings not at the right height, delay latches not falling back, iron dropper wires that had fallen off etc. I was delighted that the uncoupler electromagnets worked, and worked well under DCC control on the Lenz LH90 knob based throttle. Not so easy on the LH100, but still viable. This aspect of DCC operation had been a worry to me but the outing at Shipley proved the concept - I really could operate the layout from several feet away by hand-held throttle only - no control panel, toggle switches or buttons, just wandering freedom! Shipley also brought to light the need to protect the overhanging sector plates - this will be done by a simple modification to the support stand rather than the baseboard. I was lucky not to have one sector plate snapped off by a clumsy chap on a neighbouring layout, so lesson learnt. I also need to put a lip around the fiddle yard edges to prevent stock accidently getting cuff-swiped off the layout. I have some white plastic angle section to hand that will cure that particular problem. Much work remains to be done scenically. The undergrowth and shrubbery needs adding along with more trees. The sleeper board crossing to the horse dock and coal yard needs adding and much detailing and weathering needs to be done. Plenty to keep me busy over the winter months! Thank you for the kind comments - I'm flattered! I have to confess that the plan isn't exactly to scale - the main dimensions are accurate but the rest is "guestimated" from various photos. Saw the layout at the Oxford bash; very atmospheric and beautifully constructed.